He left Bornholm April 8th, 1857, traveling through Copenhagen. Kiel, Hamburg, Hull and Liverpool. Here he took a sailing vessel, April 25th, bound for New York where he landed May 26th, after a long and tedious journey of 51 days. He proceeded to Buffalo, N. Y., where he met the following friends from Bornholm: C. Beck,2 J. Mortensen,3 H. Ancker,4 L. Tideman,5 and A. C. Holmes.6 He finally arrived in Jamestown June 5th, where he met Marcus Jacobsen.7 These six men were the only Danes from Bornholm in America at that time to the best of Mr. Greenlund's knowledge. Most Danish immigrants in the Jamestown, New York and Warren, Pennsylvania area were from this singular origin: Bornholm. Significantly, these early Danes were young, unmarried journeymen and their skills led to their success in our region. Many Danes took Swedish wives and the Scandinavians became intermingled, although the Danes tended to maintain or promote a separate and at times "superior" identity to the Swedes. Bornholm (Bornholm in Danish) is an island in the middle of the Baltic that is about one-fifth the size of Chautauqua County. Modern Denmark is a nation of islands centered around Zealand (Sjælland ), even though Jutland (Jylland ), the peninsula that extends northward from the European mainland, makes up 70% of the country's land area. Copenhagen (København ), the capital, is located on the eastern Baltic coast of Zealand and about 90 miles (150 km) west northwest from Bornholm. The island is the fifth largest (excluding Greenland) in Denmark and is situated closer to the southern coast of Sweden – Ystad is about 40 miles (65 km) west northwest. Bornholm’s remote location led to its occupation by Soviet troops in 1945 and 1946 at the close of World War II following Denmark's occupation by Nazi Germany in 1940. 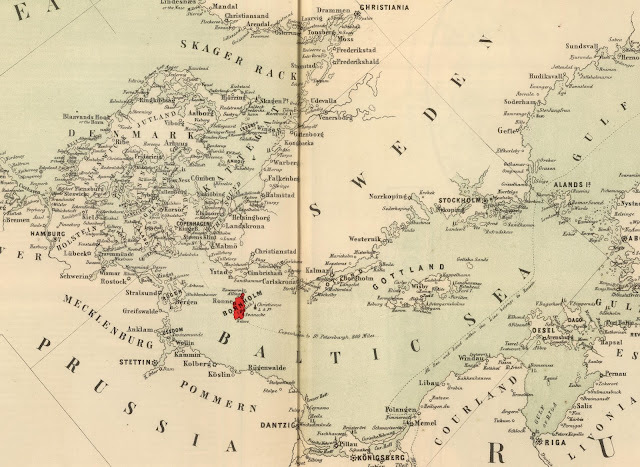 Location of Bornholm shown in red, image (cropped/red added) based on Schenck & McFarlane, Lithographers. “Chart of the Baltic from Admiralty & Russian Surveys” General Atlas Of The World: Containing Upwards Of Seventy Maps. Edinburgh, Scotland: Adam & Charles Black, Publishers, 1854. David Rumsey Historical Map Collection, Publication Reference: P4334. Publication List No: 2305.000. The earliest Scandinavians in western New York worked the ships of the Great Lakes - a mix of Norwegians and Swedes with a few Danes. One of the earliest Danes to arrive in Buffalo was C. C. Beck who began working as a shipwright in the port around 1848. In the 1850 United States census there were about six Danes in Erie County and none in Chautauqua County. In the 1855 New York State census there were a total of thirty-three Danes in Erie County and only five in Chautauqua County.9 In the second half of that decade the small Danish community in Buffalo included a group from Bornholm who arrived in Buffalo almost certainly because of the presence in that city of C. C. Beck and his wife, Caroline Christine Rønne. Carl Christian (Nielsen) Beck was born in Sweden 10 July 1826 in the southern city of Karlshamn in Blekinge län. He was the first child of master shipbuilder Niels Beck and Edel Benedicte Blache, both Danes who had recently moved to that Baltic port. Each of his parents were in their second marriage: Beck was divorced from Dorothea Winkler of Nyborg, Denmark and had five children with her; Blache was a widow of ship captain Christopher Egmon and had two children from their marriage. C.C. Beck's parents wed 11 October 1827 and had a second child, Johan Gustaf, born 12 April 1829. Niels Beck died 4 Nov 1831 in Karlshamn. His widow, E. B. Beck, moved in 1832 with her young children to Rønne on the island of Bornholm in the Baltic Sea. The younger son, Johan Gustaf Beck, died at age five in Rønne on 15 October 1834. C. C. Beck grew up in Rønne and apprenticed to become a ship carpenter like his father. Sometime after 1845 (age 19) he left the island and emigrated to America. He was listed as "Beck, ____ ship joiner, h corn. Elk & Hayward." in the 1849-1850 Buffalo Directory. In 1855 he reported that he had been living in the Lake Erie port of Buffalo for seven years, suggesting that he had arrived in America in 1848 or before. He has not yet been identified in the 1850 United States census (nor in the 1850 Danish National census). In 1850 C. C. Beck’s mother was living in the Rosenburg Quarter in Copenhagen. Her year of emigration and the ship that brought her to America have not yet been identified. In 1855 E. B. Beck was living in Buffalo in her son's household. Caroline Christine Rønne was born 19 Apr 1825 in Rønne parish, Bornholm, Denmark. She was the second child of ship captain Christian Peter Andreasen Rønne (1790-1851) and Annika Margrethe Christiansen (1796-1858). 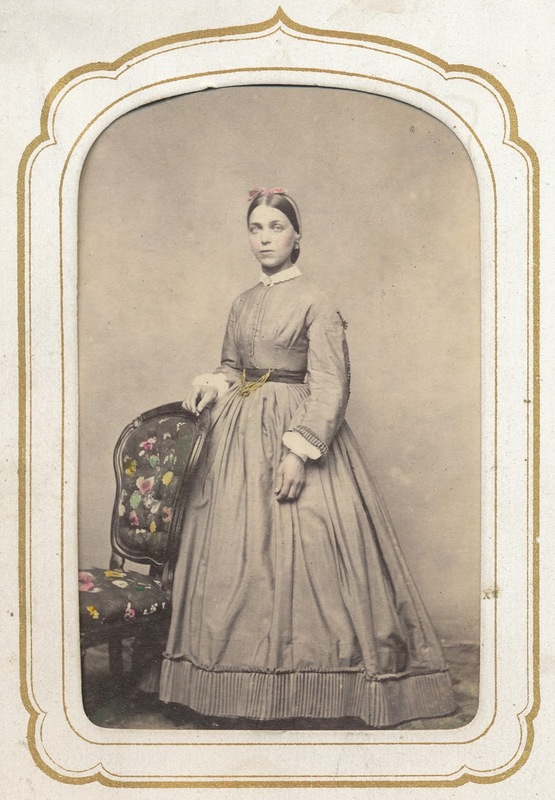 She grew up in the same town as Carl Christian Beck and left for the capitol in 1846 (age 21). She was enumerated in the 1850 Danish National census living in Christianshavn in Copenhagen. Her obituary10 indicated that she came to America in 1852, however, she has not yet been located on a passenger manifest. Her obituary also indicated that she arrived in Buffalo independently, met C. C. Beck and then married. I am skeptical of this story. It is almost certain that they would have known each other in Rønne – C.C. Beck was one of only 93 young men in Rønne who were born in 1825 or 1826 according to the 1845 Danish Census. The small city of Rønne had a total population of 4,700 in 1850. It seems much more likely that C. C. Beck had asked Caroline Rønne to come to America to marry him. And it seems likely that she was accompanied by her future mother-in-law. Location of C.C. Beck house and warehouse, Third Street near West Eight Street at the Boat Landing. Detail (rotated) from "Jamestown, Plate 37," New Topographical Atlas of Chautauqua County, New York. Philadelphia 1867. Lionel Pincus and Princess Firyal Map Division, The New York Public Library digital collection. The Beck family moved to Jamestown in 1864 where C.C. Beck opened a shipwright shop and built a warehouse near the Boat Landing and the West Eighth Street bridge. 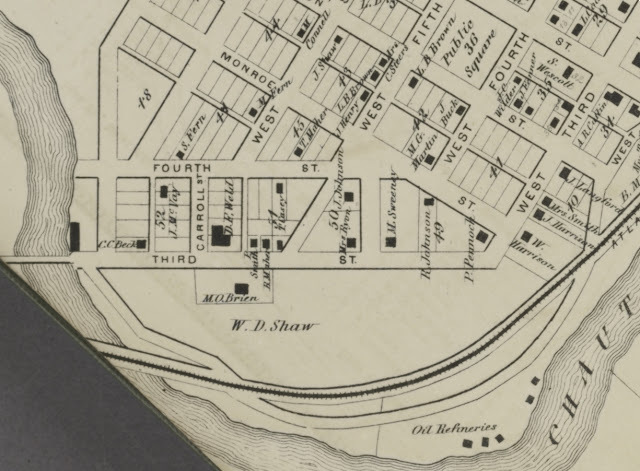 Their residence and warehouse are indicated on the 1867 map of Jamestown. Beck must have been very successful in Buffalo based on his investment in Jamestown which was estimated to be $5000 in 1865. They arrived with three children, Annie J. Beck (1852-1929), Charles Beck (1855-1876) and Andrew Beck (1856-1916). A fourth child named Alice was born in Jamestown in 1866, but died in infancy. 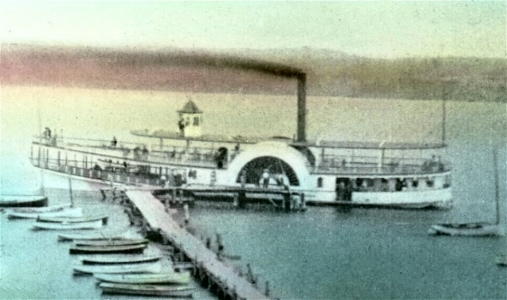 C. C. Beck built several steamships that worked Chautauqua Lake. Beck built the Col. William Phillips in 1873 and the P.J. Hanour in 1874. He was co-owner of the P.J. Hanour which was destroyed by fire later that same year. The Col. William Phillips at Griffiths Point, 1873. This steamboat was built by C.C. Beck with a length of 126 feet (38.4 m) and a a beam of 16.5 feet (5 m) and was launched in 1873. Source: Bob Johnston, Chautauqua Lake Steamboats, Chautauqua County Historical Society member pages. Photo likely from the collection of Victor Norton, Jr.
C. C. Beck had likely been a charter member of the Buffalo Yacht Club and his Banner won its division in the club's first regatta in 1860. He built the yacht Adele that was owned and crewed by other BYC members and won the Buffalo Regatta in 1875. "The Adele is a famous old yacht and has won every race in Buffalo waters for some years." (Buffalo Morning Express, September 20, 1875 cited in The History and Lore of the Buffalo Yacht Club, 1860-1960. Buffalo, N.Y., 1960 and Jamestown Daily Journal, November 6, 1875, p 1). After coming to Jamestown, C.C. Beck continued building and racing sailboats and was involved in the early regattas on Chautauqua Lake in the 1870s. His 19-foot Naiad won in 1871 and his Neptune won the 1873 regatta setting a course record 20 minutes faster than all previous finishes. The developing interest in regattas and Beck's early success with his boats led to additional business. Last Fall several orders were given to Mr. C. C. Beck, our accomplished boat builder here, for yachts, to be built in first-class style and to possess among other qualities, speed. Several yachts which had been on the Lake for a number of years and used mainly for pleasure boats, were placed in his charge with orders to fit them up for speed. Jamestown Daily Journal, June 3, 1872, p 4. Jamestown Journal, May 11,1866, p 3. C.C. 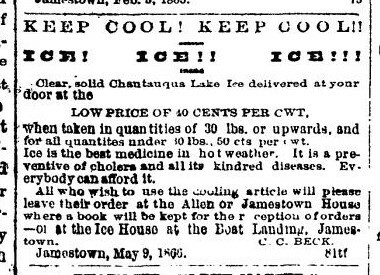 Beck seems to have been the pioneer of the commercial ice industry on Chautauqua Lake. He had constructed by 1865 a large warehouse at the Boat Landing in Jamestown which was lost in a flood that year.11 He rebuilt and in the 1870's the business was listed as Beck & Johnson. 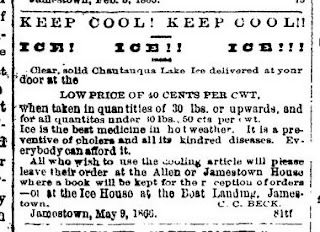 It was the singular Ice Dealer in the 1875 Jamestown City Directory. His partner was John W. Johnson, a Dane from Hjørring who had arrived in Jamestown in 1866.12 They dissolved their business in 1879 and a year later Beck & Son sold their remaining ice business to Herman Johnson and Bros, and this company became part of the Jamestown Ice Company (Jamestown Daily Journal, October 29, 1880, p 4). C.C. Beck's mother Edel died in Jamestown 4 September 1877 at the age of 86. Charles C. Beck died on 21 July 188813 at age 62. His wife Caroline lived to be 83 years old and died 26 April 1907. All were buried in Lake View Cemetery. The identity of J. Mortensen has not been determined. If Greenlund's list is accurate, Mortensen must have emigrated from Bornholm before 1857 thereby discounting his identity as Peter Morgan who arrived in 1862. The identity of H. Anker has not been determined. It is very likely that this refers to John Anchor who was working in the household of Asahel B. Tracy, a cabinetmaker in Mayville in 1860. However, he has not been identified in the 1865 nor the 1870 census. And, he has not been identified in the list of emigrants from Bornholm..
Lawrence H. Tideman born Lorentz Henrik Thidemann 14 August 1834 in Rønne, Bornholm, was the son of Jens Christian Thidemann (1804-1883) and Karen Margrethe Morgensen (abt 1798-1840). In 1850 he was an apprentice with Ole Boss, master painter in Rønne and he was living in Copenhagen in 1855. He emigrated and was living in Jamestown in 1860. 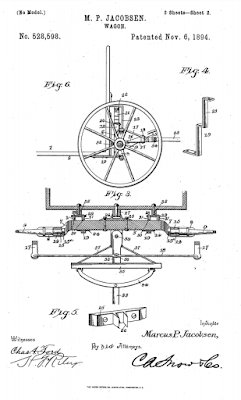 Tideman became well known in Jamestown as a carriage painter and sign painter, and received a U.S. Patent 147,531 Plastering-Boards for Walls, issued 25 July 1873. About 1872 he married a dressmaker named Anna Ueberle [sp?] who was a German immigrant from Baden. She died in 1893. He died 20 July 1899 at his daughter's house in Jamestown. Both were buried in Lake View Cemetery. In 1863, Holmes married an American, Julia Fitch, who was born in Leon, Cattaraugus County in 1842. 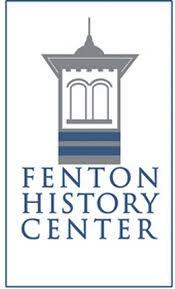 He was a merchant and salesman in Jamestown, except for a few years operating a store in Ellington in the 1860s. He died 30 April 1919 in Jamestown. The first Dane to settle in Jamestown was Marcus P. Jacobsen who arrived in late 1855 or early 1856. Some local histories indicate that he arrived in 1854,16 however, he was enumerated in 1855 in Rønne and a list of Bornholm emigrants indicates that he left for America in October 1855. Marius Peter Jacobsen was born in Polvsker parish in Bornholm on 23 June 1834, the third child of Jacob Hansen (1791-1846) and Mette Kirstine Mogensdatter (1799-1864). Jacobsen apprenticed with the blacksmith Jørgen Bjørnsen in Rønne. In Jamestown he expanded his work as a blacksmith to include wagonmaking and found success in his trade. He received U.S. Patent No. 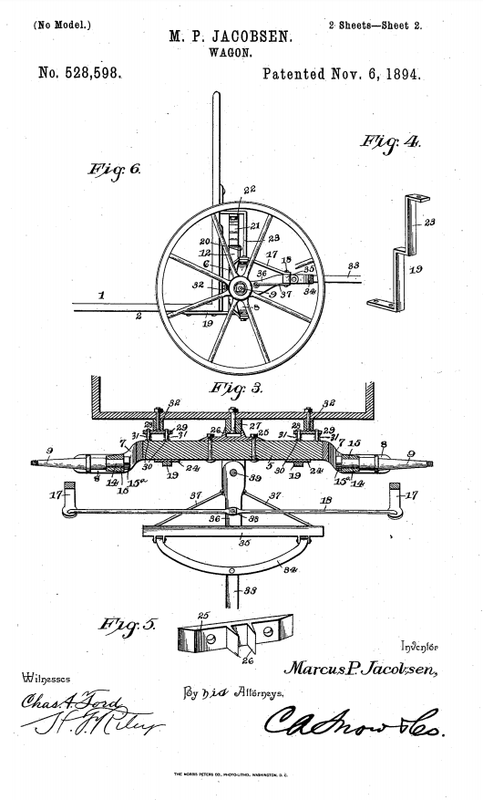 528,598, dated November 6, 1894 for a design for carriage steering and suspension. Jacobsen became active in other investments, including land development. In 1857, Jacobsen married Christina Sophia Larsdotter [1851.162] the daughter of Lars Israelsson (1807-1848) and Anna Caijsa Jonsdotter (1814-1895). 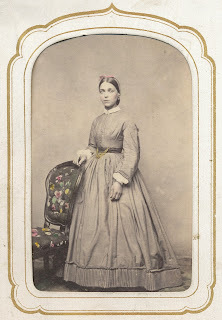 Her mother had arrived as a widow with her children in 1851 and in Jamestown she married her husband's brother and was known as Mrs. Israel (Anna C.) Israelson [1851.160]. They were founding members of the Swedish Methodist congregation in Jamestown. Alongside his wife, Jacobsen became prominent among the Methodists. He also became part of the larger (non-Scandinavian) community in Jamestown, for example, "M. P. Jacobson [sic.] joined the [Ellicott Hook and Ladder] company in 1857." (Jamestown Evening Journal, June 15, 1904, p 9). Marcus P. Jacobsen died at age 85 in Jamestown 8 Jan 1920. His wife, Sophia had died 12 September 1913. Both were buried in Lake View Cemetery. Peter and Nelson Greenlund were among many young Scandinavian men who came to America to look for gold in California. Born Mogens Peter Grønlund on 18 Jan 1831 and Niels Grønlund on 15 Oct 1834 in Rønne, Bornholm, Peter and Nelson were the first of five sons of Herman Peter Grønlund (1799-1882) and Caroline Fredrikke Hintze (1797-1866) to emigrate. Nelson arrived in 1857 in Buffalo without sufficient funds to continue to California and then traveled to Jamestown to work for Marcus P. Jacobsen for the remainder of the year. In 1858 Nelson's earnings allowed him to sail to California by way of transfer across the isthmus of Panama. His older brother Peter and younger brother Christian (August Christian Grønlund, born 25 January 1837, who emigrated in 1858) met up with him in California and after a couple years they returned to our area and then settled in Warren. Nelson Greenlund married about 1861 an American, Mary Louise Sadler (b. 20 May 1844, Chautauqua County). In 1862 he began a furniture manufacturing business with his brothers Peter and Christian. 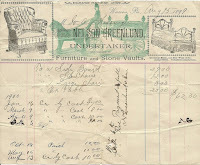 In 1879 he opened a prominent furniture store in Warren. He also was an undertaker, evidently running the two businesses from the same store front. Brothers Andrew (Andreas Johan Grønlund born 3 November 1827, emigrated 1869 with his family) and Herman (Herman Peter Grønlund, born 11 Mar 1833, emigrated in 1867) also settled in our area. 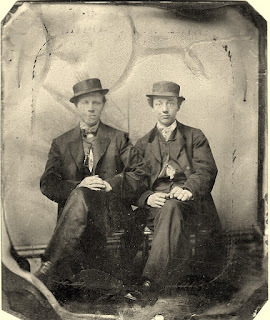 Nicholas and John P. Romer, ca 1860s. Tintype, collection of Bornholm Museum. Nicholas Romer born Lars Nicolaj Rømer on 26 September 1836 in Rønne, Bornholm, was the son of skipper Andreas Petter Rømer (1803-1849) and Christiana Holm (1802-1879). In the 1855 Danish census, Nicolas and his older brother Anders Christian were apprentices to their uncle Hovald Holm, a blacksmith in Rønne. Nicholas emigrated in 1857 and was living in the Marcus P. Jacobsen household in the 1860 United States census. In 1861 he married Johanna Larsdotter [1851.163], the younger sister of Sophia Larsdotter who had married Marcus P. Jacobsen. Nicolas Romer was joined in America by his younger brother, Hans Peter (1841-1900) in 1862 who would go by the name John P. Romer in America. Both worked in the Jefford's Axe Factory in Jamestown. The Romer brothers then began in business for themselves in 1876 in Gowanda and later in Dunkirk. The Romer Bros. Mfg. Company operated from 1876 until 1889 when it became part of American Axe & Tool Co. and continued operations into the 1920s. Peter Morgan drowned in Chautauqua Lake on 15 July 1867,18 leaving behind his wife Marie Lovisa Andersdotter [1852.081] and an infant, Charles Morgan, born 18 August 1866 in Jamestown. Morgan was a cabinetmaker working for Breed & Co. and had likely arrived in Jamestown in 1862. In 1865 he was living in Jamestown in the household of harness-maker Vernon Morley and was listed as 25 years old (1840). The identity of Peter Morgan has not been determined. A biography of John Kofod, that was likely co-written by his wife, indicated that Morgan was born in Denmark on 8 August 1843.19 He was not the same age and arrived later than the other Bornholm Danes and therefore is not likely to have been the J. Mortensen listed by Greenlund. Peter Morgan was listed as Johan Peter Morgon in the First Lutheran membership records (Jamestown First Lutheran, Ministerial Acts 1864-1888, p 101). No corroborated information connects him with Bornholm. John Kofod born Hans Julius Kofod on 29 Dec 1839 in Åker parish, Bornholm was the son of Hans Kofod and Gertrude Line Jensdatter. He apprenticed in Rønne with blacksmith Christian Holm and was in that household in the 1855 Danish census. He emigrated from Nexø 29 October 1856 with destination California and he arrived in Jamestown in 1863. He worked with John Romer at the Jefford's Axe factory and began a competing firm after the fire that ended Jefford's operation. After six years he sold his interest in that company and opened a grocery store in Jamestown that grew to be one of the largest in the city. John Kofod married in 1868 the widow of Peter Morgan. Mrs. John (Lovisa) Kofod [1852.081] was born 21 February 1847 in Karlstorp parish, Jönköpings län and arrived with her family in 1852. Her parents were founding members of the Swedish Methodist congregation in Jamestown. She died 30 April 1923 in Jamestown. The surname Kofod (with various spellings) is a surname particular to Bornholm and is about as common as Anderson or Johnson is in Jamestown. John C. Kofoed born Hans Christian Nielsen Kofod in Allinge-Sandvig (not in Hasle) parish, Bornholm on 12 March 1835 was the son of Niels Nielsen Kofod and Karen Pedersdatter of Allinge. In 1860 he was working as a journeyman cabinetmaker in Randolph, Cattaraugus County. He married Jeanette Perry of Crawford County in 1861 and they were living in Randolph in 1865. They then moved their family to Kansas and were listed in the 1870 and 1880 census. She died in 1880 and has a grave marker alongside her family in Sunnyside Cemetery in Centerville, Crawford County. John C. Kofoed died 27 January 1910 in Los Angeles, California. It does not seem that he was related to John Kofod. James Kofoed was living next door to the John C. Kofoed family in Eugene, Shawnee County, Kansas in 1870 and this likely establishes that he was Hans Christian Kofod’s older brother Jens. Jens Kofoed was born 23 December 1832 in Allinge and had apprenticed alongside Marcus P. Jacobsen in the shop of Jorgen Christian Bjorn (where both were listed in the 1855 Danish census). It is likely that Jens Kofoed was listed in 1860 as "James Kafford, blacksmith" in Charlotte township (Gerry) in Chautauqua County living in the household of John M. Brunson (NY). In 1865 James Kofod was still living in Charlotte and had married Eliza (age 40, born in Chautauqua County, her second marriage) and was again listed as a blacksmith. James P. Sanders born Jens Peter Sandbye in Nylarsker parish, Bornholm on 17 October 1841 was the son of Jørgen Sandbye and Karen Kirstine Jensdatter. Sanders apprenticed as a tailor with Peter Sørensen in Rønne and emigrated about 1861. He married Clara Denslow, an American born 1840 in Chautauqua County and was a tailor for decades in Jamestown. He died in 29 July 1923 and is buried in Lake View Cemetery. There are other relevant Danes, including Charles Ipsen, John Bidstrup, John Dimmick, et al. whose life in Jamestown and Warren have not been researched. 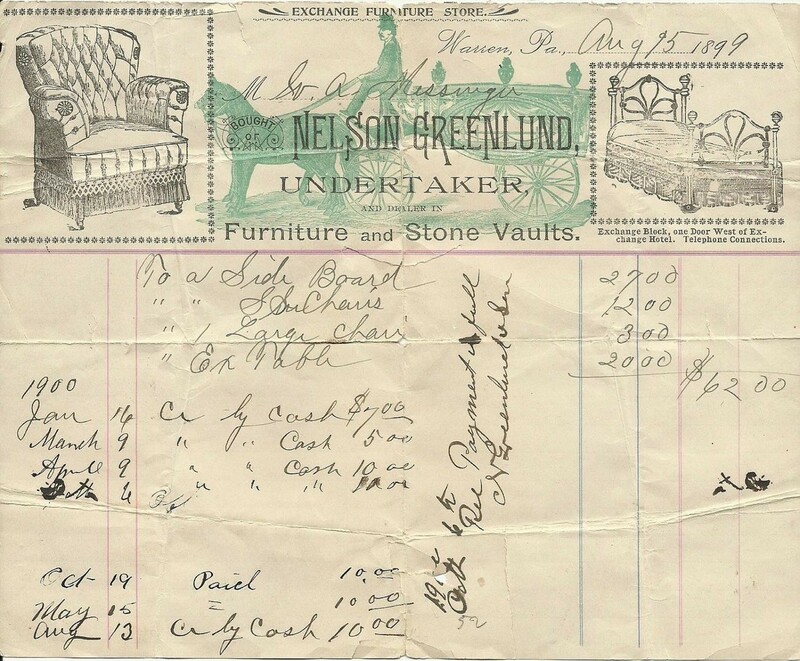 Nelson Greenlund was born 15 Oct 1834 in Rønne, Bornholm and died 6 September 1910 in Warren. His obituary included a short biography, see Warren Times Mirror, September 6, 1910, p 2. The group from Bornholm living in Buffalo were close in age and were from Rønne or had apprenticed there: L. Tideman (1834), M. P. Jacobsen (1834), A. C. Holmes (1834), and Nelson Greenlund (1834). C. C. Beck (1826) and Caroline C. Beck (1825) were notably their seniors. C. Beck refers to Carl Christian Beck, more commonly referred to as C.C. Beck (1826 Karlshamn – 1888 Jamestown). Posts by Inge S. Jensen to DIS-Danmark.dk forums led me to her research about C.C. Beck that identified his Danish parentage. I have checked the birth and household records confirming the documentation of this family. 1834 DK Census: Family No. F2, Matr No. 486e, Nørre Qvarter, Rønne Parish, Vester Hundred, Bornholm amt. See Danish Family Search. 1840 Confirmation: Rønne parish, Hovedministerialbog 1835-1845, p 118 (image 398/506). See Arkivalieronline. 1840 DK Census: Family No F4, Matr No. 135, Sønder Qvarter, Rønne Parish, Vester Hundred, Bornholm amt. See Danish Family Search. 1845 DK Census: Family No. 329/F3, Øster Kvarter, Rønne Parish, Vester Hundred, Bornholm amt. See Danish Family Search. 1852 Alien Declaration: Erie County Court, Alien Declarations, Liber 8, p 165. See Family Search. 1856 Citizenship Petition: Erie County Superior Court, Naturalization records, Liber 5, Page 411. See Family Search. 1888 Death: Death Certificate No. 3431, Lake View Cemetery records, Jamestown, New York. See New York Heritage Digital Collections..
A note about Niels Beck: my research has not clarified if Niels Beck had been granted a divorce or was in the process of getting a divorce from Dorothea Winkler. Moving to Denmark (a foreign nation) was a common basis for divorce in Sweden in this time period, and conversely, it may have been a reason for Niels Beck's relocation to Karlshamn. J. Mortensen has not been identified. H. Ancker likely refers to John Anchor – Danes named Jens and Hans often adopted the name John in America. There was a Danish photographer in Akron OH (date unknown) named H.P. Acker whose photo is included in the collection of Bornholm Museum. A.C. Holmes refers to Andrew C. Holmes (1833 Allinge-Sandvig parish, Bornholm – 1919 Jamestown) Note: I have not been able to locate him on ships arriving in New York City at the end of August 1854 (as per his obituary). Nor have I been able to locate him in the 1855 or 1860 census. Bornholm and Lolland-Falster were the regions with the highest rate of emigration (138 emigrants per 1000 population) based on census data between 1870 and 1901, see Kristian Hvidt, Flight to America: The Social Background of 300.000 Danish Emigrants. New York: Academic Press, 1975, p 40-41. Available in digital format. For a study of Bornholm emigration see Henning Bender, “Den oversøiske udvandring fra Bornholm og Danmark 1840-1940.” Bornholmske Samlinger 2011, Rønne, Denmark, 2011, p 2-41. Also available in digital format. This reference was of great help in understanding the Greenlund family (Grønlund). Please note that this article included an error regarding the identity of Mrs. Nicholas Romer, of which Mr. Bender is aware. New York State statistical summaries. See Franklin B.Hough. Census of the State of New York for 1855: Taken in Pursuance of Article Third of the Constitution of the State and of Chapter Sixty-Four of the Laws of 1855. Albany: Printed by C. Van Benthuysen, 1857. 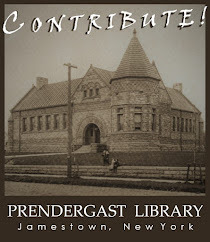 Digital version available in several volumes from the New York State Library. The Danes enumerated in Chautauqua County may have been a German married to a Dane. The Carl A. Zimmerman family lived in the Town of Pomfret in 1855 and then moved to Perrysburg in Cattaraugus County. This family arrived 21 April 1854 aboard the barque ELISE in New York City from Hamburg and the manifest indicated that their origin was "Holsteen." Schleswig-Holstein was the territory lost by Denmark to Germany in 1864, so the listing of the Zimmerman family as Danes was part of an identity that became more complicated. The 1880 census listed the origin of Mary Zimmerman as Denmark and her deceased husband Charles (Carl) as Holstein. DEATH OF MRS C.C. BECK. Aged Citizen of Jamestown Passed Away Thursday Afternoon. The death of Caroline C. Beck, widow of Charles C. Beck, occurred at the family home, 17 West Seventh street, Thursday afternoon at 2 o'clock at the advanced ago of 82 years, seven days. She leaves one daughter, Miss Anna L. Beck; two grandsons, Chas.O. and Lemotte A. Beck; and one great grandson, Earl C. Beck. Mrs. Beck was one of the early Danish residents of Jamestown. She was born in Ronne, Denmark in 1825. She came to this country in 1852, residing then at Buffalo where in the autumn of the same year she met and was married to Charles C. Beck, a resident of Buffalo. About 12 years later they removed to Jamestown where Mr. Beck for a number of years conducted a boat livery at the city dock. His death occurred some years ago. Mrs. Beck was well and favorably known especially among the older Danish residents of the city. She had many excellent qualities which endeared her to her friends. The privilege of seeing the remains is given to all friends Saturday from 11 a.m. to 12 p.m. The funeral will be held privately Saturday afternoon. Jamestown Evening Journal, April 26, 1907, p 12. The Elements on the Rampage! – A Small Deluge and a Repectable Hurricane! – "Water, Water, Everywhere!" - Great Loss of Property! – The "Oldest Inhabitant" Dumb-founded! The most serious and deplorable loss in any one case hereabouts is the destruction of BECK’S monster ice-house at the Boat Landing. The water surrounded it, melted the lower strata of ice and that above slipped down in a wedge-fashion so as to burst the building apart and ruin the whole in a few hours. What did not melt was drawn away and stored in private ice-houses. There were 1,200 tons of ice in it, the work of the whole winter. Mr. B.’s loss will be $5,000. It is a serious loss to the village also, as many who usually furnish their own ice were depending on his stock for their supply. Jamestown Journal, March 24, 1865, p 3. Thanks to Norman Carlson for forwarding this article to me. Available in digital format. John W. Johnson was born Jeppe Johansen on 19 July 1844 in Tversted parish, Hjørring amt, Denmark the son of Johan Christian Jeppesen and Maren Larsdatter. Two sisters and a brother also emigrated and the date of birth (2 December 1851) of his younger brother Charles Johnson and the names and ages of his sisters corroborate this identification. J. W. Johnson died 12 March 1918 and was buried in Lake View Cemetery. C. C. Beck is by and large omitted from local histories despite his essential role in the Danish community in Jamestown. Alcoholism was the cause of death listed on his death certificate. This possibly motivated the remarkable erasure of his contributions from local histories and his minor consideration in the obituary of his wife. The expunged record of C. C. Beck's accomplishments occurred during the era of the Temperance movement whose influence in the Jamestown area was significant, especially among prominent Swedes and Danes. 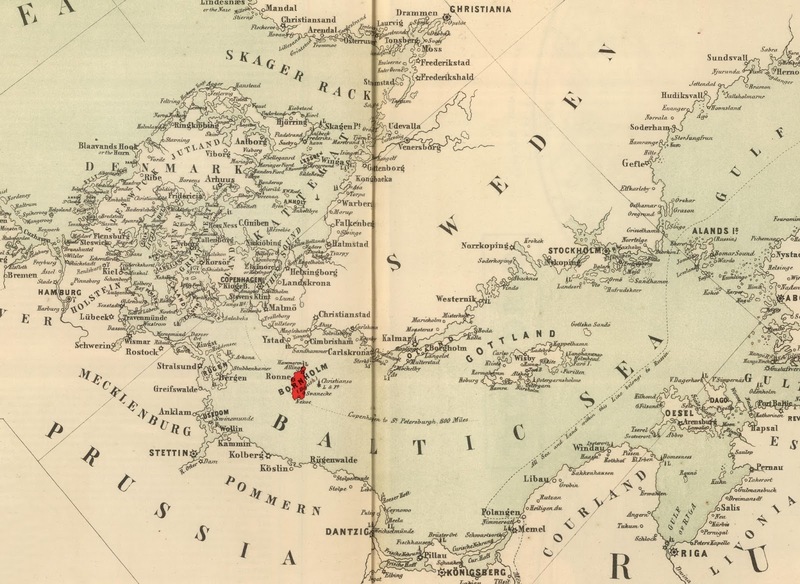 A.C. Holmes connects to other Bornholm emigrants: 1) his aunt Christiane Holm (1802-1879) was the mother of Nicholas and John P Romer; 2) his uncle Christian Holm (1810-1884) was the master blacksmith with whom John Kofod apprenticed; 3) his uncle Hovald Holm (1804-1890) was the master blacksmith with whom Nicholas Romer apprenticed; and 4) his brother was Nicholas H. Holmes. Andrew Christian Holmes, whose death occurred Wednesday, April 30, at the family residence, 825 Prendergast avenue, was born at Allinge on the Island of Bornholm, Denmark, January 11, 1833. When eleven years old, while studying English, he made this vow; "I will go to America and use this language if God lets me live to be a man." This purpose grew stronger with the advancing years and at 21 he took passage alone, the first boy to leave Bornholm for America. He arrived in New York August 28, 1854, and for a time lived in Buffalo, then came to Jamestown where he lived until 1861 when he located In Ellington, N. Y. There he conducted a general store and became identified with the life of the community. On June 10, 1863, he married Julia Fitch, and to them were born four children, Emily W., Catherine L., Mary P., who died in 1910, and Albro C. Holmes. After spending a year in his boyhood home he moved to Jamestown, where for more than 30 years he has been an honored and respected citizen. Mr. Holmes was a member of the First Congregational church and a faithful attendant until prevented by failing health. Jamestown Evening Journal, May 1, 1919, p 6. Rev. Nicholas Howell Holmes (1841 Rønne –1915 Washington, D.C.) Biographical information from Find-a-grave ID 17915248 . "The first Dane to arrive in Jamestown was a 20 year old blacksmith and carriage maker, Marcus P. Jacobsen, who came in 1854." part of the Jamestown centennial history "The Coming of the Races" Jamestown Evening Journal, June 21, 1927, p 13. 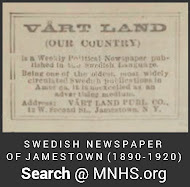 As noted, this year of immigration is incorrect, the research about Danes for this centennial history was by the John Love (1848 Bornholm-1923 Jamestown). Olaf A. Olson noted: "The first Dane came here in 1855, and he was M.P. Jacobson [sic]. The departed C.C. Beck was one of the first, also." Olof A. Olson, "The Swedes" in Obed Edson and G. Drew Merrill (eds), History of Chautauqua County, New York. Boston: W.A. Fergusson, 1894, p 748. Available in digital format. For Jacobsen's listing in the 1855 Danish census see Danish Family Search. The date of the enumeration was 1 February 1855. Jacob A. Riis. The Making of an American. New York: Macmillan, 1902, p 79. Available in digital format. See also Romer family biographies in John Phillips Downs (ed). 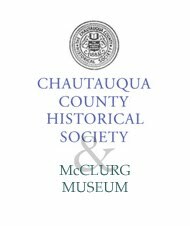 History of Chautauqua County, New York, And Its People, Volume 2. Boston: American historical Society, 1921, p 162-163. Available in digital format. Peter Morgan drowned in Chautauqua lake 15 July 1867. A Dane named PETER MORGAN was last Saturday drowned in the Lake off Griffith's Point, where he had gone with a picnic party of Danes from this place. He went out into the Lake in a skiff with two other men for a bath; could not swim; let himself down into the water by the boat and presently -- either from fear or by reason of a cramp -- let go his hold and after a little struggle went to the bottom before help could reach him. His body was fished up some hours afterwards with a hook and line. Deceased was about 30 years old; leaves a wife and one child. He was a cabinet-maker; has been about six years employed in BREED'S shop; was a very superior workman, a steady, industrious man. His funeral took place on Sunday from the Lutheran Church. Jamestown Journal, July 19, 1867, p 3. Butler F. Dilley. Biographical and Portrait Cyclopedia of Chautauqua County, New York: With a Historical Sketch of the County. Philadelphia: J.M. Gresham, 1891, p 516. Available in digital format. Erie County Court, Alien Declarations, Liber 8, p 165. LDS Film # 007776685, image 174/623 available online through FamilySearch. Blogs, tables and "Jamestown Swedes" calligraphic image copyright 2014-2018 by John Everett Jones. Powered by Blogger.